I like a concise menu, the sort where you can order the lot and not feel like a glutton. The menu at Yeni is perfectly concise. Dishes are split into small and large sized plates. Starters (smalls) are moderately sized but big on flavour. Beetroot comes soft and fruity with luscious scoops of xigalos (a soft creamy cheese similar in texture to labneh). The flavours are cut with sharp sour cherries and finished with a generous glug of peppery, green tinged (a sign that it’s the good stuff) olive oil. The celeriac, though subtle in comparison, is equally layered with flavour. Braised in olive oil first it is served finely sliced with quince and just a hint of anchovy. Yer is an artist when balancing seasoning and the rest of the dishes do not disappoint. For my vegetarian friends I’d advise to go heavy on the starters. 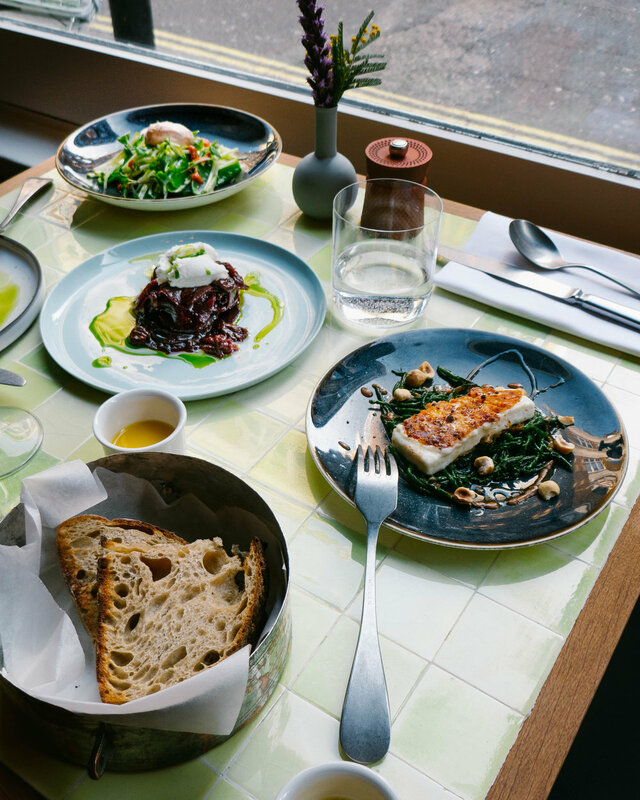 You’d have a very happy meal with the top half of the menu alone and can fill any corners with sourdough and clarified butter (complimentary to the table). 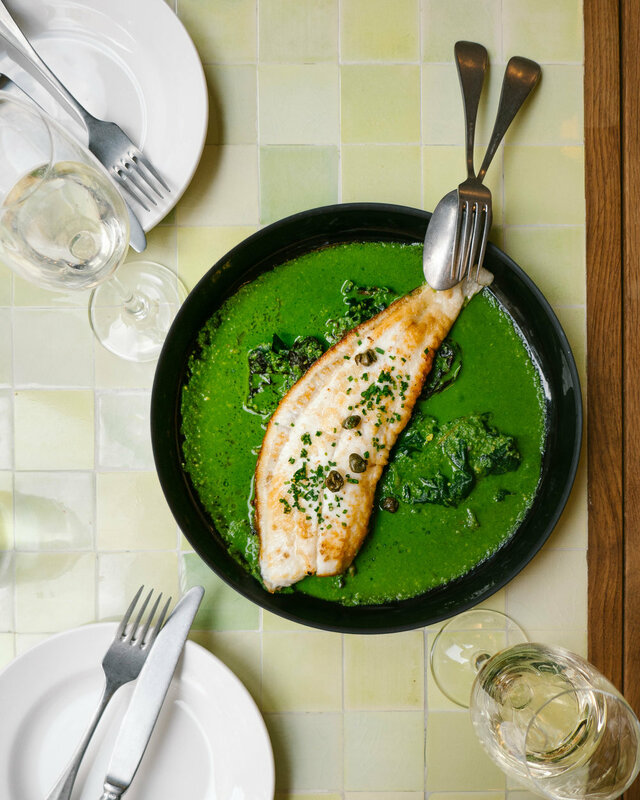 I order the brill as a main which arrives balanced on a shallow pool of glorious green. There are leafy greens and prunes in there too and the fish is perfectly cooked. On menu the dish also comes with pastirma but I mention I don’t eat meat so it’s fully fish for me. Fully fish and delicious. My carnivorous friends applause the meaty dishes too with top marks for a ‘fall off the bone’ lamb shank. Savoury dishes are definitely the lead roles at Yeni though they offer two puddings. Both sound a touch too creamy for my liking so I opt for coffee and sample one of my partners custardy filled fritters which although aren’t up my street are certainly a win for him. 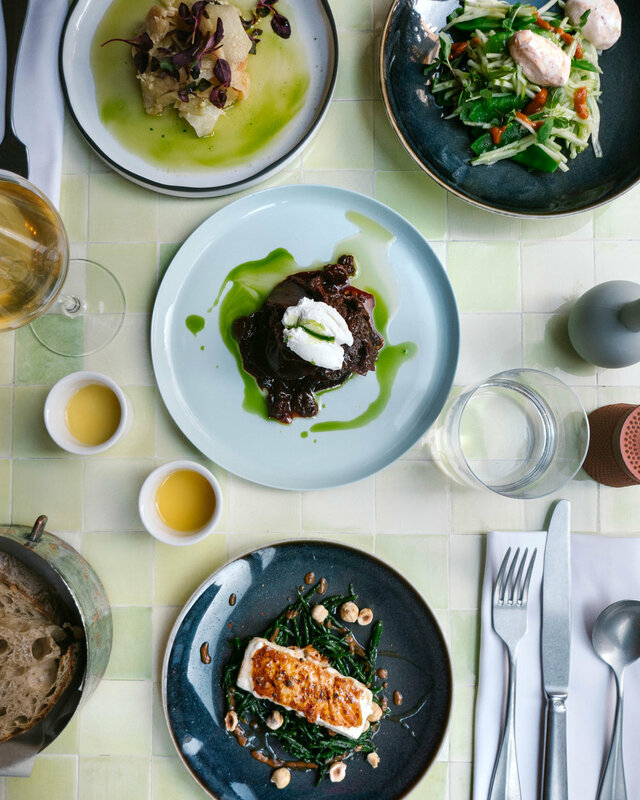 Personally I’d skip pudding and order an extra portion of the pan fried feta with honey, samphire and hazelnuts which is divine. Coffee is served the Turkish way at Yeni, strong and slightly gritty with varying levels of sweetness. It’s a bit of a marmite situation. I like it and whilst it isn’t for the faint hearted it will certainly eradicate any post lunch slump. Prime position in the heart of Soho Yeni is a stones throw from Soho square. The best seats are on the ground floor by the window, allowing a prime view of the open kitchen and a perfect people watching spot. The windows which are practically floor to ceiling flood the room with natural light that bounces cheerily of the dusty yellow and green tiled tables. Staff are incredibly helpful and will advise or assist on any menu queries without insisting on reciting a sonnet for every dish that arrives. It has a light and informal atmosphere which I imagine ramps up a bit during the evening. I shall have to return.